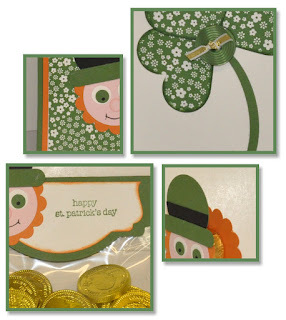 Just Julie B's Stampin' Space: St. Patrick's Day Punch Art Leprechauns! Leapin’ Leprechauns! Celebrate St. Patrick’s Day and share the luck of the Irish with your friends and family with these fun treats and cards. People can’t help but smile when they see these adorable punch art leprechauns and shamrocks. This project includes two treat holders, a bookmark, and two matching cards. They are fun for grown-ups and children alike and would also make a great class or club. This super cute project was made by Yapha Mason, and you can get her tutorial when you subscribe to the month of March over at Craft Project Central.